Are sodas over 16 ounces banned in New York City or not? Large sugary drinks' days were numbered until yesterday when a state supreme court judge overturned the ban that was supposed to go into effect today. I've been known to guzzle large amounts of Coke during long, hot bike rides, so I can't say I was totally against the ban. But on a daily basis, I'd much rather drink something natural and healthy. And lately, that's been sparkling juice, thanks to my new SodaStream seltzer maker (a Valentine's gift from SJ). By mixing fresh juice into seltzer, you can make a natural soda without any added sugars or coloring. And there's now ban on how many ounces it can be. Citrus juices are a good place to start (goodbye, Sunkist!). Not only is citrus in season, but juicing it doesn't require fancy equipment. Last week I made a blood orange sparkler and this week pink grapefruit. 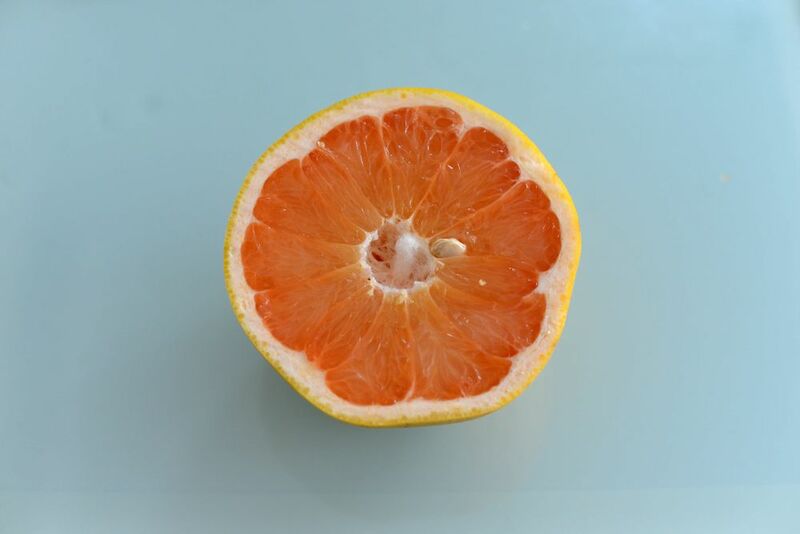 When I squeezed the juice from the pink grapefruit, it was a disappointing yellowish color and not pink I was expecting. So added natural color with the juice of one small blood orange. This made about one cup of juice, which is enough to flavor about two liters of seltzer. But if you are only making one glass at a time, use what you need and store the extra juice in a jar in the refrigerator. If the juice is too tart, mix in a few drops of maple syrup. This juice makes a good post-workout refresher and serve it with a warm bowl of butternut squash soup. Juice fruit by hand or with a citus juicer. Pour juice into glass or bottle and top with cold seltzer. **Update: Laurel pointed out to me that this juice would be easy to make using a Citruszinger water bottle. This a water bottle with a citrus juicer attached to the bottom. It allows you to infuse the juice right into the bottle. Less clean up and less fuss. Thanks for the tip, Laurel!